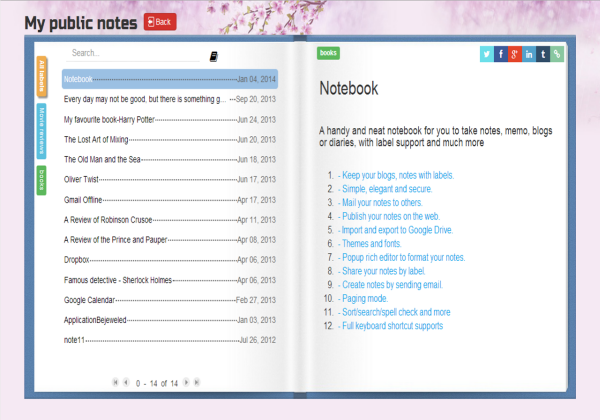 A handy and neat notebook for you to take notes, memo, blogs or diaries, with label support and much more. Multiple notebook with different covers. Many pretty themes and fonts. 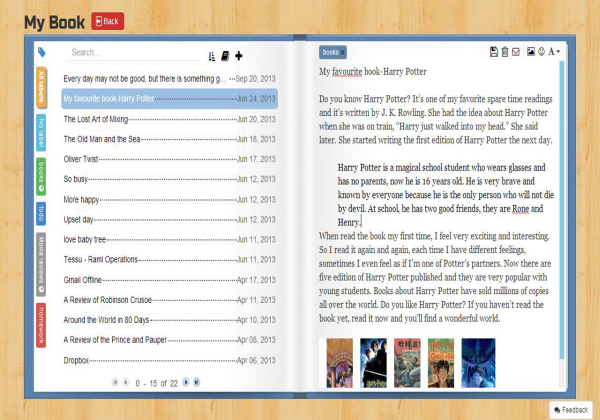 Popup rich editor to format your notes. 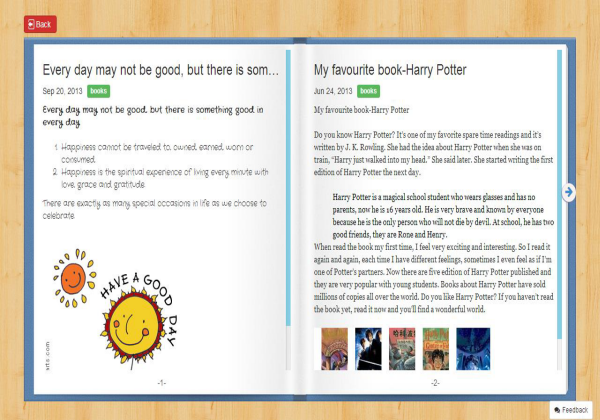 Publish your notes on the web to let others read it. Paging mode, just like what you do on a real book. Simple and secure: by default only you can access. Import and export to Google Drive. Mail your note to other people. Create notes by sending email. I figured out how to save my notes. I love this app. And i can't believe it's FREE, wow Thanks for making it soooo easy to do. I give it a 5 star rating. Even if i find any problems along the way. Cause i'm sure you will take care of it. I can use it on any of my many apps. AWESOME M. Boyd in Tangent, Oregon!!! About 99% of what I was looking for to help organize my novel writing notes. I've looked at and tried so many other apps from note takers to sticky notes, but this one does what I need it to, in a clearly organized and easy to use way. I am SOOO VERY IMPRESSED WITH THIS APP. I would GLADLY pay for this at a small yearly rate. I have been SEARCHING ENDLESSLY for the past TWO YEARS, (no joke), for an app like this to keep track of monthly household expenses. 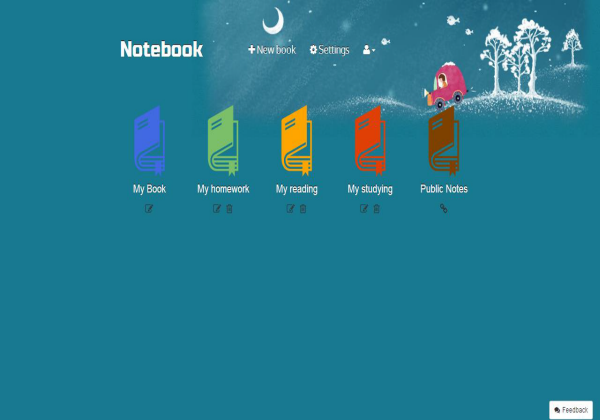 And I was searching for NUMEROUS other similar apps to keep track of other various things. BUT...AS SOON AS I TRIED THIS, I REALIZED THIS IS THEE ONLY APP I NEED FOR EVERY SINGLE THING I NEDD TO KEEP TRACK OF. This is, SO FAR, my "PERFECT ALL IN ONE APP". A HUGE "THANK YOU" to the creators & designers of this app. I LOVE IT!!! One small note, although VERY "user friendly", more instructions regarding how to change the size, color, font etc from line to line, would be helpful for those who don't "accidentally discover" how to do it, like I did after 15 minutes of frustration!! Other then that small over-look, it is seriously my perfect app. This is cool. With this kids can write secretly without people knowing like a book people can steal and read. This is awesome! I used to use quick note for school until it got deleted, so I was in the search for another note service, and I searched through about five others before I came to this one. I've loved it the entire time! Extremely well put together!